Hi all. ive been trying to plan fish for my 32 gal bio cube. I think a leopard wrasse would be awesome but some places say they’re really hard to care for. Why is that? Do they eat pellet/flake food or need live pods? Also some places say they’re listed as difficult because they struggle to survive shipping. Are they hardy once acclimated? Help choosing tang. Is it a good fit for my tank? Hi all. I have had a 20 gal nano tank for a while now and have also added a new 32 gal bio cube that has been up and running for years with the previous owner and about a month since I moved it to my apartment. (I kept filter material live rock etc.) tank parameters are all excellent (haven’t checked calcium/alkalinity though). And it has been very stable for weeks. I am planning what what fish I will add to this tank and was hoping I might add a juvenile tang. Before everyone attacks me for the idea of a tang in a tank that size I do plan to rehome the tang when it outgrows the tank. My questions are these: can a juvenile tang be housed in my tank? is my tank mature enough for a tang? what species is recommended? what species grows slowest and needs the least swimming room so I can house it the longest? what tangs are less aggressive? what tangs are best at controlling algae? is my tank mature enough to add fish like this/when will it be ready? what size is too big/when to rehome tang? i hope some experienced reefers can weigh in. Ting into account all those questions what tangs would you recommend if at all? 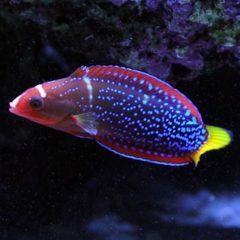 I want something that I can buy small, will stay small for longer, is able to grow largest before needing a new home, and is a decent community fish with other semi aggressive species (damsels wrasses dwarf angels hawk fishes etc.)? thanks to anyone who takes the time to read all that and can offer advice. I really appreciate it. Hi. I'M new to the forum and was hoping some experienced reefers could offer some advice on my coral health! I have a 20 gallon DIY mixed reef tank that has been running for about 6 months. I have about 1 year experience running a 75 gallon reef tank that I took down about 6 years ago when I left for college. Everything I have added (soft corals, LPS, fish, inverts, nem) seems healthy and has been a pleasure to watch. Up until now I have never tried any SPS corals. 5 days ago I decided to venture into some "beginner" SPS. I don't have very accurate water testing kits so I am not looking to advance any further with difficult corals until I can at least better monitor my water parameters. I have a very large amount of live rock for the tank size and two hang-off-the-back filters (in case one ever fails). My heater is a decently stable and my digital thermometer always reads 78.4-78.8. My lighting is not very strong: Marineland LEDs rated at about 100 par at 12 inches and 6000K. It is also not diffuse at all and has almost spotlights of higher intensity throughout the tank. (yes, I plan to upgrade my lighting when I have the funds in about a month). I bought two montipora frags 5 days ago, one large orange monti cap and one small sunset monti. Both came from my LFS and were not shipped (at least not any time recently). To compensate for my low lighting I placed them about 5 inches down in the water directly under the "spotlights" from my LEDs. I really don't know enough to tell if they're doing ok or not. given that my situation is atypical bordering on stupid (I know it sounds bad) I want to make sure Im not killing the frags. I have a friend with a very successful SPS tank who will take them if I'm hurting them and I just don't want to see them die! I think they might be doing ok. I'll be watching for long term signs of health but I just wanted to ask if there are any issues visibly indicating immediate shock from new/bad tank conditions. Please don't be too hard on me. I know you'll want to know my water parameters and more details than I can probably measure. I don't want advice on keeping them alive as much as advice on how to tell if they're healthy (although all input is appreciated). If they aren't healthy I will rehome them at the first clear sign they're declining. I have attached pictures. I have a 20 gallon tank that has been set up for about 6 months and have been having great success with soft corals so I decided to pick up a trumpet coral and chalice frag 2 days ago. The trumpet seems happy but the chalice looks concerning. I know they don't like a lot of light while they adjust so it is at the bottom of my tank out of the direct light from my led lights (they are not particularly strong anyways). right away i noticed a little bit of brown discoloration on the side of the coral. over the couple of days I've had it the brown area seems to have become more distinct although no skeleton is exposed. I know there's a lot of variables at play (water params, parasites, lighting, handling) but what I want to know is whether this is a sign of a serious problem. The brown spot hasn't really progressed noticeably in the last day so is it a cause for concern? Although I do want to know why this happened I'm more concerned with just knowing what is happening and how worried I should be. So I’ve been working at this aquatic shop for about 2 years, we specialize in freshwater, however I own many tanks and recently decided to start a saltwater tank at home. My manager and I are very good friends, he often comes over and helps me out with water changes and testing levels. However when I came into work today as I was changing in the break room I came across a bag. Inside the bag I discovered was a mantis shrimp, a freaking mantis shrimp. I closed the bag and went to investigate what the heck was going on. In the quarantine room I discovered my manger filling a stock pond with RODI water. I was alarmed because for one we only specialize in saltwater two, I had a bad feeling that shrimp was going to be used to cycle the aquarium. Low and behold 5 hours later we’re closing up for the night and my manger brings out the poor shrimp. He explains to me that the shrimp would most likely survive. I still had a bad feeling as I watched him dangle the bag over the pond. Next thing I know the damn shrimp has punched the damn bag and fallen to the floor. I felt sick as my manger picked the poor thing up and dunked it into the water. The water wasn’t cycled and i have no idea what the temperature was. I’ll keep you guys updated.